" The physical production is elaborate and stunning, with sets by Beowulf Boritt." "What’s most successful, and most striking, about Chaplin is its look. Director Warren Carlyle and his design team have, ingeniously, rendered the stage and the cast as an early-Hollywood silent-picture world. Nearly everything is in black, white or shades of gray: the Deco-influenced, movie-scenery sets by Beowulf Boritt, the costumes by Amy Clark and Martin Pakledinaz, even the makeup by Angelina Avallone." "What remains indelible is the visual imprint of the production. Beowulf Boritt’s sets and Amy Clark and Martin Pakledinaz’s costumes give black-and-white sophistication a good name"
"Clever touches abound, such as monochromatic costumes by the late Martin Pakledinaz and Amy Clark and sets by Beowulf Boritt that give the production the look of an old B&W movie." "Unfolding amid fluent black, white and grey visuals by designer Beowulf Boritt." 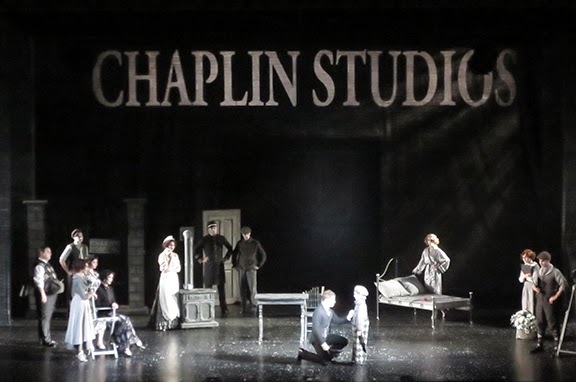 "A great big tip of the hat to the technical designs rendered almost entirely in shades of black and white evoking silent films, complete with flickering lights and expert use of projections." "It looks good! The stylish project’s sets and projections are all white, black or gray." " Designed largely in shades of gray by Beowulf Boritt (sets) and Amy Clark and Martin Pakledinaz (costumes), “Chaplin” presents life at the top as “la vie en gris.”"
" The monochrome sets (Beowulf Boritt) and costumes (Amy Clark and the late Martin Pakledinaz) have an Art Nouveau elegance that’s strikingly illuminated by Ken Billington."